We woke up this morning to a brisk, sunny 35 degrees. Brrrr! I finally have some time to catch up on the blog. So much has happened, and again, I don't always take pictures. So you'll just have to read about the Bramell family adventures. The first weekend in October, Grammy and Nanny came for a visit. The weather was perfect for an afternoon at the pumpkin patch! The kids all ran around, we took a hayride around the farm and picked our own pumpkins to bring home. We like the McGarrah's Farm in Pea Ridge; this was our second time there. We tried a different one last year but I didn't like it as well. Here are my two littlest pumpkins checking it all out! Becca loved riding on the mule train. Funny pictures made us giggle. All the kids loved playing in the hay tunnel. What a great, fun idea! Evan & Carley weren't sure what to think about hay. They both touched it and looked confused. What does a cow say?? MOOOO! Two cool dudes. You can see the pumpkin patch behind them. Carley on the hayride through the farm. We all enjoyed the ride and the stories about the haunted farm. Big girl just wanted to climb, climb, climb. Such a warm day that her face was red like her shirt! After wearing the kids out at the farm, we topped it off with a yummy dinner at Monte Ne Chicken. We don't go there often, but when we do, we wonder why we don't go more! I guess it's never too early to learn the Hog Call, right? I came home from the store yesterday to find that Lee had been practicing with the babies. So cute! And this video is from a day later; they still remembered how to do it! Crazy Weekend/Friday Night: We were planning to head to Silver Dollar City first thing on Saturday morning. Instead, Evan barfed right after dinner. Then Carley barfed in her bed about 10:00pm. Second baths and changes later, they seemed fine. Not sure what was going on, but there was a sick kid in daycare last week so we figure it's some little bug. Saturday: We woke up to pouring rain and cool temps, to find that Branson weather wasn't any better. We decided with poor weather and possibly sick babies, we'd better just keep the Crazy Train at home. Decided to postpone the trip to Sunday, where frankly, the weather didn't look much better but we'd chance scattered storms. Lee's nephew, Shane, stopped by to see us since he was in town for the Razorback game. We took Carley for her second haircut and went to eat lunch out on the town. We topped off the afternoon with a Bramell Family Nap and Hogs on TV. Pretty good day, after all. Sunday: We woke up to cloudy skies at home. Checked out the Branson forecast and decided to take a chance. Of course 60% chance of scattered storms meant trouble. It didn't rain a drop on us the whole way there--until we pulled into the parking spot at SDC! The bottom fell out, and it started to thunder and lightning! Thankfully, we hadn't made it out of the van yet (like the poor suckers parked beside us!). We waited there for a while, then went back into town for lunch and more waiting. The kids were TERRIBLE during lunch. It was still pouring down rain, so we went right back home! Ugh. 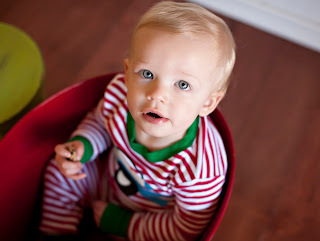 By the way, Evan has started throwing food at the table; it's lovely. We may never eat at a restaurant again. Enjoy the video. It's the highlight of our weekend. Good night. Oh, they are growing up so fast! Why didn't anyone warn me how hard it is to watch your kiddos grow up and change so fast? It's really pretty fascinating. Little Miss Becca has really found her personality this summer. She is starting to "get" humor. Her big thing at the moment is the ever-loved Knock-Knock Joke! God help us. We'll take turns; she tells us one, then we have to tell her one. Of course, her jokes never make any sense, but we all laugh like crazy hyenas anyway! Then, she will say: "Joke me!" when she wants us to tell her a joke. This goes on for hours until I could poke my eye out with an ice pick. Lee and I really need to step up our game because her jokes are usually funnier than ours. Last week, she moved up to the 4-year-old class at daycare, which is technically preschool now. She has a new teacher (Ms. Leah) who I think will be awesome for her. Besides being the mother of twin boys, Ms. Leah is a real certified elementary teacher! This makes us so happy about what lies ahead this year; Becca is going to learn so much. Can't take pictures of the babies without taking some of the big girl, too. It was spaghetti night at the Bramell house. Yum! I caught Carley & Evan playing footsie at the dinner table. Of course, they quit by the time I got the camera out. They have even starting holding hands in their high chairs, too. It's sweet. We've had Becca's play tent and tunnel put up under the bed for a few months because our house was overrun with toys. So I took the tunnel out the other day for the little ones to play with. They loved it! You can almost see how hard they are thinking while trying to figure out what the tunnel is for. I guess Fergie told them what to do. Carley and Evan are almost 15 months old now. Carley has finally started giving kisses--I thought she never would! They are starting to babble at each other a lot, but nothing is making sense yet. They also seem to fight with each other more; one taking toys from the other, etc. I can't figure out who is the bully; I think it's pretty even. However, I do think that Carley is the mastermind and Evan is the muscle in most of their schemes. 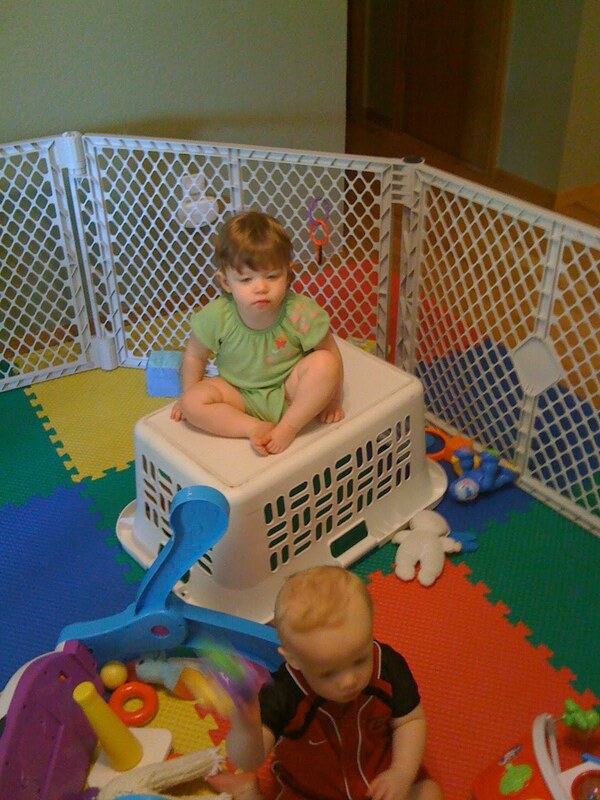 They are starting to work together to do things--like open drawers, climb on things, dump over the trash, etc. You can just see Carley trying to show him what to do, then they both get it going together. It's hard to get mad when they are laughing like maniacs over pulling out all the tissues or unrolling an entire roll of toilet paper. Oh yeah, and if you are visiting the Bramell house and something comes up missing--check the bathtub. Seriously. The tub is the new lost & found: shoes, binkys, toys, brushes, you name it. One guess who the culprit is? You're wrong....we caught HER in action this weekend. And I have to tell a funny on Evan. I swear I am not even exaggerating about this. The boy will stand up to pee in the bathtub every night!! At least 3 nights of the last week he stood up, grabbed the towel bar with both hands for support and peed right into the tub. WTH? It's like he is totally doing it on purpose. Just in case you have been wondering about the difference in little girls and little boys, I will show you here. I have no words to describe this crazy little boy. Also notice how his sister is playing quietly in the background. Ever wonder what we do at night? Carley & Evan are officially walking!! Things just got a whole lot more nutty around here. It's always playtime right before bed. Probably another reason why someone is always getting a bloody lip. I've had this post written in my head for a few days, so I need to just get it down before I forget. I'm doing a poor job keeping baby books or memory books for the kids, but so thankful for the blog to help document all the things I want to remember to pass on to them when they are bigger. I took this picture of Carley the other day. She is our climber! We never had to worry about Becca climbing very much, but Carley is a whole other story. WOW. This was one morning while I was getting ready for work. I put them in the "cage" to play and walked back through the house to find her on top of the laundry basket. Carley is just really quirky, I think. Besides climbing on the laundry basket, her favorite spot in the house is on top of the hearth. Now, it's really just about a 3" step...but she loves to sit up there. What's funny is that she can't figure out how to get down! She'll sit up there and play forever, then cry when she's ready for us to come get her down. It's hilarious! She also has a lovey, which Becca never did. She loves to sleep with her blankie then drag it around the house all day. The kids are usually sitting at the table eating dinner when I get home from work in the evenings. Becca and Fergie will run to me at the door, Evan will wave at me from his high chair, and Carley will scream bloody murder and cry until I pick her up for hugs. On the days when they aren't already eating, it's a dogpile on the floor when I come home. I love it! It's so sweet to be missed when I'm gone. Talk about a busy-body! Evan is on the move and never, ever still. It's strange to already be able to see such a difference in having a baby boy vs. baby girl. He is so destructive; he tips over the trash can, flops around in the tub like a fish and throws things like crazy. His favorite activity is throwing the ball--and he's really good at it! He can throw right to where he's looking and he can stop a rolling ball with his hands and legs. YAY~~maybe we'll have a Major Leaguer! The other day Lee and I went together to pick her up at school. She got into the van and asked us if we know Justin Bieber! Lordy, I am so not ready for that yet! I guess the kids talk about the Biebs, because we definitely do not at home. Her: When I get big, we can all work at at restaurant. Her: Me, You and Daddy. I'll be the cooker and you and daddy can be the bringers! Her: You know, you bring people the food!! Big girl Carley got her first haircut the day after her 1st birthday! She really had been needing one for a couple of months, but I wanted to wait. There is a new place in Fayetteville for kids called Pigtails & Crewcuts, so we gave them a try! The decor is so cute, with the fun chairs and TV's everywhere. Carley surprised us for sure! I expected to have to hold her for the haircut, but check this out! She sat all by herself and never made even a little peep. She was perfectly still and quiet and the lady was finished in 5 minutes. I just couldn't believe it! It was a Saturday and the place was packed, so we ended up waiting a long time. I guess the waiting must have worn her out. We went ahead and got Becca's hair cut, too. She really liked the toy room to wait in and she liked getting a sucker after her hair finished. She looks so big sitting in that car! Here are a few more pictures that came off my phone. 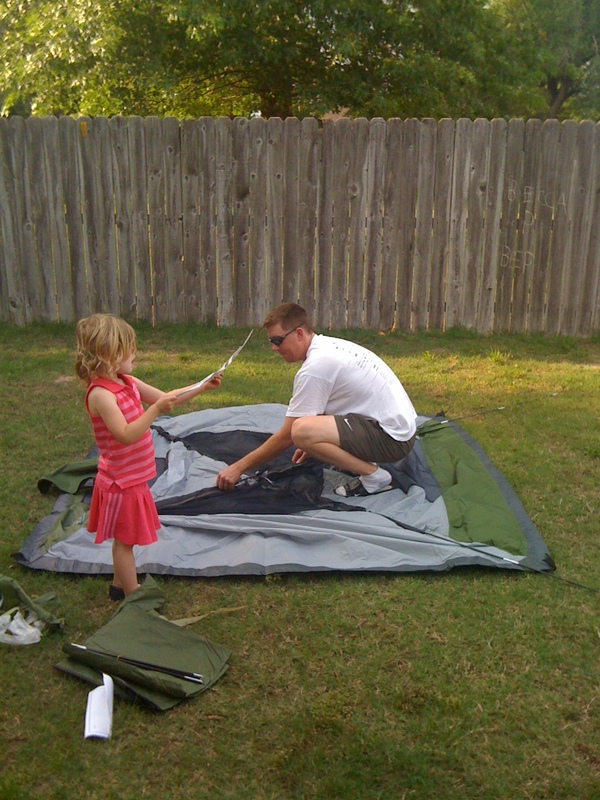 Lee and Becca decided to have a backyard camp out over Memorial Day weekend. Can you tell who the boss is here? Poor Lee, got the tent all set up and hauled all the crap outside and they only stayed out for about 2 hours! Becca didn't want to settle down and go to sleep out there; but in her defense, it was pretty warm. Not too fun sleeping outside when it's 80 degrees! I know they will try again when it cools off; she was so excited about "going camping." Maybe we will even be brave enough to try the real thing with all the kids. This picture actually came from Ashley's phone. She took Becca for her first big-girl pedicure on her birthday! I didn't get to go because I was getting everything ready for her party, but I think they had a good time. Doesn't she look like such a big girl? 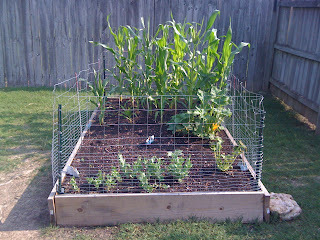 Here is our awesome little garden! We have really been enjoying it this summer. Thank goodness I married a man with a green thumb. For as long as I can remember, Lee has always talked about planting a garden. I don't have the time or the patience for it, I guess. Lee did every bit of the work to build and plant this thing. I just eat the goodies! We've had corn, peas, yellow squash and cucumbers. The green beans didn't ever grow. Becca has really liked watching the garden grow and helping to pick the veggies, too. We loaded up the crew and had a fun day at Wilson Park to celebrate Memorial Day. We joined our friends Mike and Jessica, Jason and Misty, and James and Angie to cook out and play. It was a pretty hot day but we toughed it out. Becca got to play with Emma and dip her feet in the water at the castle. She got in lots of playground time, too! Carley and Evan just hung out and watched all the action. Becca loved playing at the castle. It's one of Fayetteville's landmarks. This is the park that is right behind the Kappa Delta house, where I lived for 3 years in college. I spent lots of time walking and studying at this park. Trying to keep the babies on the blanket was pretty funny. They weren't crazy about the grass, but also didn't want to sit still! Poor Becca was so red-faced and hot!! The first week of June was the annual Walmart Shareholders meeting in Fayetteville. Each year, they bring in several big-time concerts that are free to the public. I've been to a few over the years; I usually only fight the crowds if I think it's really worth it (i.e., Will Smith). This year, we decided it was worth it again!! We got a sitter for the babies and took Becca to see her first live concert and she really liked it! She loves listening to Lady Antebellum in the van, and knows several of their songs. Poor girl was just tuckered out by the time they got to her favorite song Need You Now. Of course, they save the best/most popular song for last. By that time, she was nearly asleep in my lap! Darius Rucker (from Hootie & the Blowfish) is now a solo country star and opened for them. He did a great show--I enjoyed it a lot! He was great with the crowd and sang his own songs and some of Hootie's. You can see we had pretty good seats, though we were on the side of the stage instead of in front. The downside was that we had about 5 levels of speakers blaring in our faces. I was afraid Becca would fuss about it being loud, but nope!